Do not fairly compensate the farmers. Instead, I look for “Organic,” and “Fair Trade” chocolate (which avoids GMOs, and fairly compensates the growers for their hard labor). My preference is Belgian chocolate with high % cacao mass that comes in a large bar that you can grate or chop into small pieces like chips, or melt in a double boiler. But because this chocolate is more bitter and less sweet than commercial chocolates in America, what adjustments do I need to make to a recipe? What about other chocolate substitutions? Read on for more. Cocoa powder can contain up to 10% its weight in flavonoids. However, when it is alkalized (as for Dutch-Process or European-Style Chocolate), the amount of flavonoids is greatly reduced. If you are making a chocolate dessert for a special occasion, you may wish to use the sweeter Dutch-Process powder; but for a regular treat, when you want the most healthful goodie, choose regular cocoa powder. helping to combat diabetes; the chocolate must contain at least 70 percent cacao and be sweetened with organic cane sugar. See also Using Cocoa Powder, below. What is Cacao Mass and Percent Cacao Mass? Cacao mass is a paste of roasted cocoa beans with cocoa butter and solids in their natural proportions. It is what provides the chocolate flavor and the healthful nutrients attributed to chocolate. Pure cacao mass is quite bitter with a distinct absence of sweetness. Percentage of cacao mass (% cacao mass) gives an idea of how pure a chocolate product is, and also how bitter (less sweet) it is. For example: a bar of chocolate with 70% cacao mass is fairly healthful, and is only 30% sugar. A bar of chocolate with 90% cacao mass is very bitter indeed, with only 10% sugar to offset the bitterness. When you replace a lower % cacao mass chocolate (for example, 35%) with a higher % cacao mass chocolate (for example, 70%), you may wish to increase the amount of additional sweetener in the recipe. This is especially true if you replace white chocolate with a dark, high % cacao mass chocolate. But go easy at first, perhaps adding only 1/4 tsp sugar or its equivalent for each ounce of chocolate, then tasting. I don’t especially like my chocolate goodies to be too sweet. If I have a recipe calling for semi-sweet chocolate chips (for example, 35% cacao mass), and I want to use extra-bitter chocolate chips (for example, 65% cacao mass), I do not increase the sugar because I prefer the goodie to be less sweet. But if I want to use chips that are 90% cacao mass in that recipe, I would add a bit of sugar. Your preferences may be different from mine. See also Whats Cooking America’s Chocolate Substitution Chart (9) or Just a Pinch (blog) Chocolate Substitution Chart (10). If you read the nutrition label on dark chocolate sold in the US, it includes only the minimum information required by law, which reports fats, cholesterol, sodium, carbs and protein, in grams and % daily value, per serving (serving size is also defined on the label). It does not include grams of cocoa. However, elsewhere on the label or packaging, the % cacao mass should be provided. If not, I would look for a different product. You can use the grams * of sugar on the nutrition label to compare products and help you determine how much sugar to add if you use a higher % cacao mass product. However, you may need to adjust for serving size when making the comparison. For example, compare a Dark Belgian Chocolate bar whose serving size is 30 grams (3) with a Hershey’s Dark Chocolate Pieces whose serving size is 15 grams (2); both products contain 8 grams sugar per serving. For a fair and accurate comparison, you need to level the playing field – compare equivalent serving sizes. 8 grams sugar per 30 gram serving of the Belgian chocolate is equivalent to 4 grams sugar per 15 gram serving (the same serving size as the Hershey’s product. The two products can now be compared fairly. Clearly the Hershey’s product has almost 4 times as much sugar as the Belgian chocolate. * NOTE: Labels use grams as the chocolate measure because different presentations (powders, shavings, chips, squares and bars) are not consistent in volume measure. That is, 1/4 cup shavings will weigh more in grams than 1/4 cup chips. The relationship: % cacao mass + % sugar = 100% applies only to dark chocolate because it is almost exclusively cacao mass and sugar (it contains no milk or fillers). It does not apply to milk or white chocolate (which are discussed below), because they contain significant amounts of other ingredients besides cacao mass and sugar (such as milk, milk solids and emulsifiers). 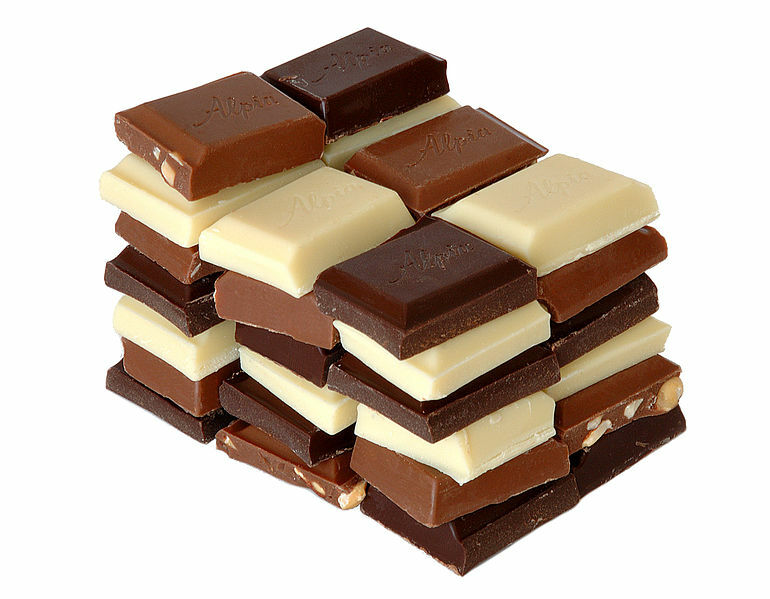 White chocolate contains no cacao mass at all. However, % cacao mass is a useful measurement for any type of chocolate, as an indicator of bitterness and healthfulness of the product. If you want to use the most healthful chocolate, choose one that is at least 70% cacao mass. Typically, this is about 40 – 50% cacao mass, similar to German Chocolate, which is a good substitute. If you replace semi-sweet or bittersweet chocolate with sweet dark chocolate, you will need to make very little, if any, adjustment to the sugar in the recipe. But if you replace milk or white chocolate with sweet dark chocolate, you will likely want to increase the sugar. For baked goods, etc., they can be used interchangeably without adjusting the amount of sugar/sweetener in the recipe (6). However, if you use them instead of milk or white chocolate, you may want to make a slight increase in sugar. Milk chocolate contains sugar, chocolate (cocoa), cocoa butter, sugar, cream (milk fat), emulsifiers such as soy lecithin, and vanilla flavor. It must be at least 10% pure chocolate (cacao mass) according to US law (5, 6). White chocolate has no cacao mass at all (% cacao mass does not apply). White chocolate is the fat from chocolate (cocoa butter) plus milk solids, milk fat, sugar, emulsifiers such as soy lecithin, and vanilla to give it structure and flavor. 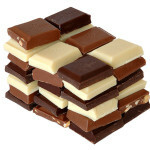 According to Wikipedia (5), white chocolate is about 55% sugar. % cacao mass does not apply to white chocolate because it is essentially 0%. If you want to use dark chocolate in place of milk or white chocolate in a recipe, see my discussion above for Dark Chocolate. On the other hand, milk chocolate and white chocolate are fairly interchangeable and will likely not need to be adjusted for amount of sugar. It is similar to, but sweeter than, semi-sweet chocolate; containing a blend of chocolate liquor, sugar, cocoa butter, flavorings, and lecithin. Cocoa powder – cocoa solids – is dried, powdered cacao with most of the cocoa butter removed. It has no added sugar or flavorings. However, because most of the cocoa butter has been removed, % cacao mass does not apply. Oops, I lost the original text for this section. This entry was posted in Chocolate, Cocoa and tagged chocolate, sugar. Bookmark the permalink.